Transit & Paratransit Drivers, Trainers, Safety Leaders and Shop employees. Our transit and paratransit bus driver training courses do change the behavior of drivers to avoid accidents and keep everyone safe. The courses are built around high quality driver and passenger safety videos designed to engage the class and provide effective learning. Used by over 70 agencies. 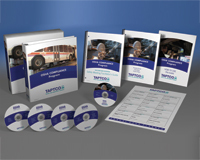 TAPTCO is pleased to offer bus driver training and certification materials that work…delivering a more professional driver, better performance and fewer accidents. The Transit & Paratransit Company – Taptco – offers the most advanced professional bus driver training courses that turn new and experienced drivers into expert drivers. Our bus driver training programs focus on safety behind the wheel and in all aspects of the job. These state of the art training courses help drivers become safety aware, reducing errors and the number of accidents on the road. Used by the largest transit and paratransit operations in the world, our courses train bus drivers to be safe drivers. Drivers who participate in our programs are the safest on the road. Effective training and education can greatly improve driver performance and the Taptco courses are designed to make sure it happens. Drivers who participate in Taptco bus driver training programs know what to do and how to do it. Why consider Taptco’s courses if you already have a driver training program? 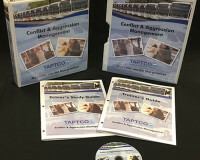 Taptco uses the most advanced, up-to-date training materials available. Our courses includes professional video and messages that keep training from becoming mundane and boring. Driving has changed, so should your driver training program. Taptco offers a modern, behavior-based programs that help drivers prepare for real-life experiences they will encounter every day with passengers and on the road. Better trained drivers are safer drivers who are more efficient and encounter fewer problem when they are behind the wheel. 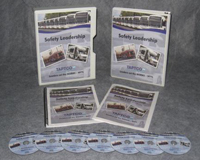 Taptco offers 28 driver training programs with comprehensive guides and course materials. We have invested over $500,000 into creating the best possible bus driver training courses possible, so your drivers can be the safest and most professional on the road. Drivers trained with Taptco courses are trained to do the right thing the first time and every time. They are knowledgeable and after completing our training programs, their skills are honed to help them be the best drivers on the road. 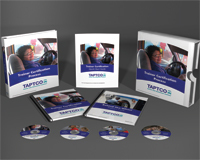 More than 70 transit and paratransit companies already use Taptco training programs. Our courses can be customized for your drivers. Whether you want to train new drivers or you need courses for drivers who are experienced, but want to help them feel refreshed and motivated about their work, Taptco can help. We help bus drivers take their driving performance to a whole new level. Training that works. Training that gets results. To learn more, contact Taptco today. Check out our free bus driver training programs, including a free webinar, free demo disc, or free copy of the Pedestrian Awareness Course.